The S/S19 collection was inspired by working women who chartered the way before us. We garner the values of simplicity, effective design, and empowering ideals from them. These denim pieces embrace functional design for hard-working women — because your clothes should work just as hard as you do. Our denim is ethically sourced, heavy, and durable: a 12 oz. organic denim that is a rare jewel in the world of natural fibers: no stretch, no lycra, no elastic, and no polyester. Just 100% organic cotton denim. Strong and durable, produced without GMOs, pesticides, dioxins, or formaldehyde. Made in Europe from premium 100% organic cotton. Sweatshop-free. The social and economic dynamics of the American workforce changed drastically during and after WWII, as women and minorities became a majority in the labor roles. This shift was a key component to restructuring the labor workforce formerly limited to men. Women needed durable clothing to work in shipyards, warehouses, factories, and manufacturing facilities; hence the rise of fabrics like denim, canvas, and wool in workwear for women. It became a revolution of the nature of the proletariat workplace and a revolution of the fashion industry as well. The images featured above are from Willow Run, an airplane manufacturing plant and aviation school in Ypsilanti, Michigan (just two hours from our studio). This facility focused on the education of the female population regarding the engineering and manufacturing of B-24 bombers during WWII. This plant became so efficient that they could produce one B-24 per hour. The women and minorities who contributed to this effort eventually changed the landscape of the American workforce, and for this reason are our inspiration. Images found online: History in photos, Ford Museum in Grand Rapids. MacKenzie is a potter, printmaker, and landmark creative. She’s wearing the Rosie Coveralls . Featuring organic 12 oz. denim, brass snaps, large front pockets and enough room to go over your clothes. 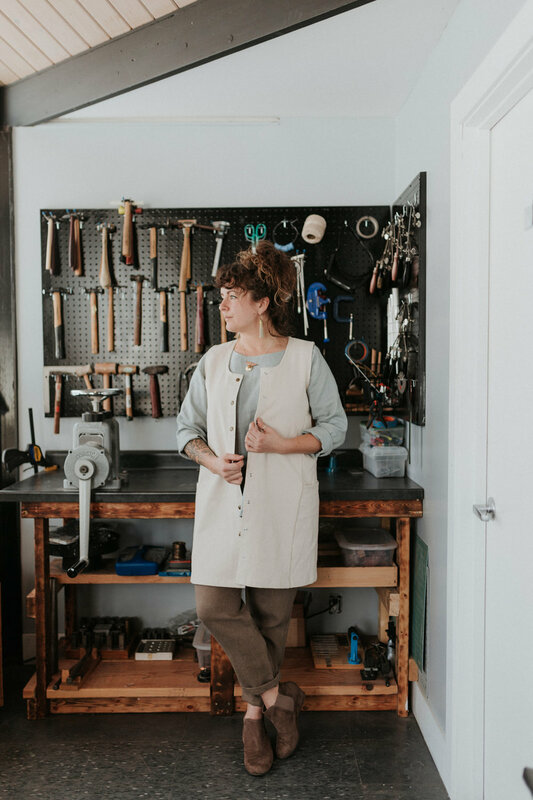 Laurel is a metalsmith, gardener, and an effortless soul. She’s wearing the Natural Denim Snap Smock . Featuring 12 oz. organic natural denim (also available in Indigo) and brass snaps, the snap smock has large side pockets for storing tools and can be tossed over your favorite clothes. Photos by Leigh Ann Cobb. The Orion Overalls came out last year, but we trimmed them up and slimmed and cropped the leg so you could accomplish more as you run around. These beauties feature organic 12 oz. indigo denim, elastic at your low back, adjustable straps, and large front pockets. Jackie is wearing the Comrade Work Suit in Natural Organic denim. Featuring front square pockets, one back pocket, brass snaps, short sleeves, and a collar. Love this look? You’ll need the Beachside Bandana, too!